The book of the show. Recently, I have been reading John Williams, the Sydney photographer and critic. Like him, and many photographers of my generation and older, I was first inspired by the Family of Man exhibition. As you may know, for Edward Steichen, this Museum of Modern Art exhibition represented the “culmination of his career”; the exhibition was an extraordinary feat, containing 503 photos from 68 countries which represented 273 photographers (163 Americans and 70 European photographers constituting the majority) selected from almost 2 million pictures submitted by famous and unknown photographers. After its initial showing at The Museum of Modern Art in 1955 from January 24 to May 8 in New York, the exhibition toured the world for eight years, making stops in thirty-seven countries on six continents. More than 9 million people viewed the exhibit which most believe is still the record for a photography show. Now archived and displayed at Clervaux Castle in Luxembourg, the country in which Edward Steichen was born, in 1879, in Bivange, the show also lives on in book form which has sold over 4 million copies. at the pile of 2 million photographs selecting for his exhibition. Incidentally, the Millers feature in Steichen’s show. ‘The World is Young’ represents an application of the post-war American optimism that inspires ‘The Family of Man’ to the Millers’ own family in an exercise to which Wayne Miller devoted a year photographing his own family of four children growing up at home and going to school in California. As a 13 year old, after being handed down my father’s Nikon S3 rangefinder camera, and in imitation of the Millers, it became my goal to document the children of my neighbourhood in the same way, but my teenage shyness meant the project was intermittent, then short-lived. That is why I pored through these two books in awe at the sheer adventure of photography. The Family of Man has had, I believe, an unfair share of critics. The earliest to complain were photographers who felt that Steichen had submerged individual talent and set back the acceptance of photography as art. Walker Evans, in a pot/kettle pique, complained of its “human familyhood [and] bogus heartfeeling” (Walker Evans, “Robert Frank,” US Camera 1958 (New York: US Camera Publishing Corporation, 1957), 90.). If Mr. Steichen’s well-intentioned spell doesn’t work, it can only be because he has been so intent on [Mankind’s] physical similarities that…he has utterly forgotten that a family quarrel can be as fierce as any other kind. Phoebe Lou Adams, “Through a Lens Darkly.” Atlantic Monthly, no. 195 (April 1955), p. 72. It is quite right that the show was blockbuster in format, scope and distribution. But any examination of the layout will reveal that far from herding its audience through like cattle, the MoMA exhibition, and also its overseas manifestations where space allowed, opened onto internal chambers from where the audience could decide to enter one room or another, following their inclination. 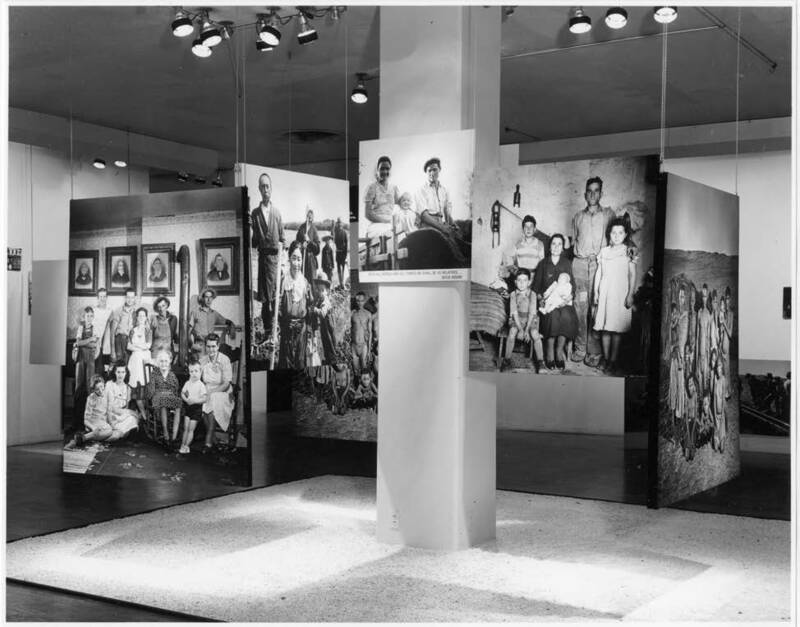 Ezra Stoller, installation view of the exhibition The Family of Man. Champions of the exhibition take account of the political and cultural context in which the show appeared, including Eric J. Sandeen in ‘Picturing an Exhibition: “The Family of Man” and 1950s America’ (Albuquerque: University of New Mexico Press, 1995) and Blake Stimson, ‘The Pivot of the World: Photography and Its Nation’ (Cambridge, Mass. : MIT Press, 2006). I take heart at the way Fred Turner in his reforming essay ‘The Family of Man and the Politics of Attention in Cold War America’ (2012) (from which I quote in this post) disposes of several decades’ worth of critical disdain to illuminate what really was a deeply democratic, even utopian, impulse that drove the show and much of the early audience response to it, and an antiauthoritarian politic behind its design and the modes of attention it solicited from visitors. Edward Steichen, “The Museum of Modern Art and ‘The Family of Man,’” in A Life in Photography (Garden City, N.Y.: Doubleday, 1963), chap. 13.
show Man to Man across the world. Here we hope to reveal by visual images Man’s dreams and aspirations, his strength, his despair under evil. If photography can bring these things to life, this exhibition will be created in a spirit of passionate and devoted faith in Man. Nothing short of that will do. Allan Sekula, “The Traffic in Photographs,” Art Journal 41, no. 1 (1981): 15–21. For a summary and analysis of critical responses to the show to 1999, see Monique Berlier, “The Family of Man: Readings of an Exhibition,” in Picturing the Past: Media, History, and Photography, ed. Bonnie Brennan and Hanno Hardt (Urbana: University of Illinois Press, 1999), 206–41. Kristen Gresh, ‘The European Roots of The Family of Man’, The History of Photography Special Issue on the Family of Man, vol. 29, no.4, Winter 2005, pp. 331–43, and Sandeen, ‘The International Reception of The Family of Man’ in the same issue, pp. 344–54. Jörn Glasenapp, Die Deutsche Nachkriegsfotografie: Eine Mentalita ̈tsgeschichte in Bildern (Wilhelm Fink: Munich, 2008). Christina Klein, Cold War Orientalism: Asia in the Middlebrow Imagination, 1945–1961 (University of California Press: Berkeley, 2003), p. 188. NOTE: Much of the text for this post is an edited version of contributions I have made to the Wikipedia entry on “The Family of Man” exhibition. ← In loving memory of Mary Ellen Mark (1940-2015).